Rib span measures 13′ from corner to corner. Mount the rotating foot pedal directly to your deck for permanent clean installation or use the cross base with patio stones for a portable unit. 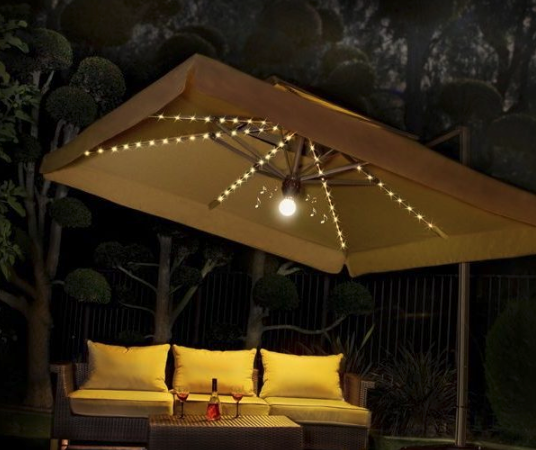 40′ of beautiful LED ambiance rope lighting with over 200 individual 12-volt lights build right into the umbrella ribs. No filaments to burn out. A super elegant lighting system that is much more attractive than exterior attached lights. Center globe moon light uses standard 12volt #1157 bulb and has a bright setting for dinner, reading or playing games as well as a soft ambiance setting for after dinner entertaining or parties. The 3 position light switch gives you the option for bright light or soft ambiance lights and has a center off position. UL approved 12-volt in-line transformer comes with a long 30′ weatherproof cord. Converts a standard 110v electrical outlet down to a 12-volt system. Marine Grade Anodized Powder Coated Frame that is ribbed for extra strength and will not rust. Neutral champagne frame color with 8 rib canopy construction. 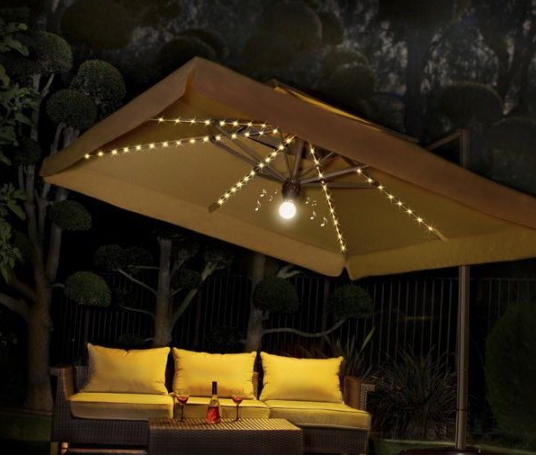 Ribbed Frame construction makes it stronger than standard umbrella frames. Ratchet Style Crank Assembly with unique pulley system to easily open or close your umbrella quickly. Pedal assembly with stainless steel bearings has locking mechanism with 12 positions to lock the umbrella from turning in the wind. Also rotates and locks in the tilted positions. EZ Tilt Trigger control allows tilt function with one hand operation.